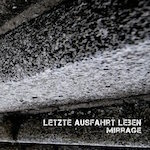 Germany’s LAL open up the proceedings with a tense urgency, as sirens ring and distorted ambience slips and slides dramatically; as subtle beats and tribal percussion patter in repetition. In contrast, ‘Damnation’ carries the ambience in PE fashion as a more familiar structure takes hold with the drum structures; the blend of the two forces works well and once again, it’s a tense affair. Letzte Ausfahrt Leben play with monotony with the same familiarity of bands such as Sonar. It’s a key ingredient to the overall hypnosis of the music; that holds the listener in a fixed state of concentration as opposed to boring them to death. A clever use of vocal sampling works well with the distorted beat/powernoise blend and this also assists in keeping ‘Mirrage’ from stagnating. LAL also have the ability to turn it on when needed; and the title track ups the pace somewhat, but blends harmony into the torrid mix; and dare I say it smacks occasionally of originality. However the main ingredient that keeps this artist relevant is the ability to mix up the tracks effectively with pace and sincerity; no two tracks follow the same path, alternating between the singular monotony I mentioned previously and up-paced frenetic club beating, coupled with smatterings of Dark Ambient. Overall, an interesting release that wouldn’t be out of place on the Hands label as far as styles go. Not a world-beater, but engaging none-the-less and worthy of investing some time in.